Favorite Credits: The ones at the end of "The Golden Girls". Why theater? : We choose a theater mainly because of the roof. Being inside a theater is a definite plus on rainy days. 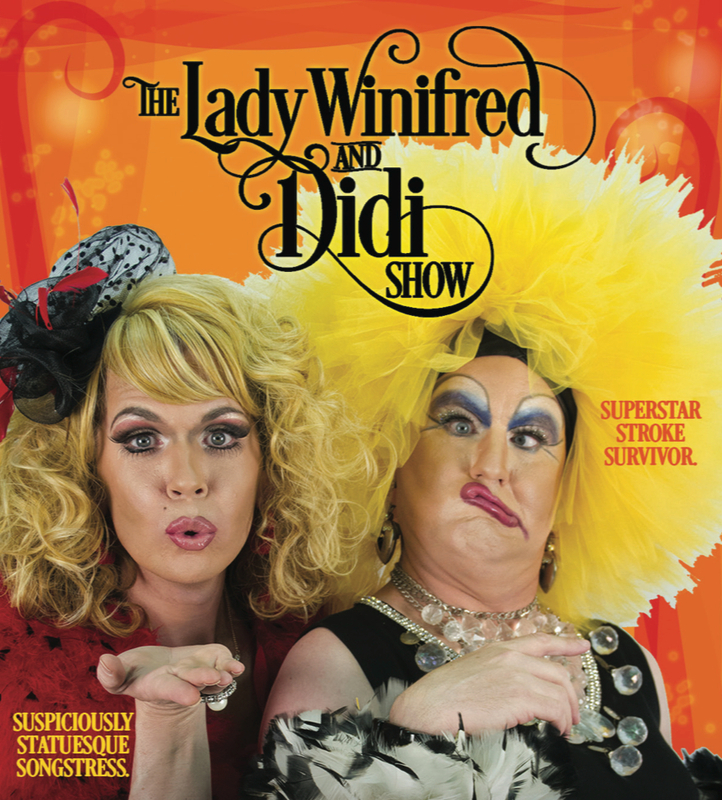 Tell us about The Lady Winifred and Didi Show: We like to think of our show as Martin and Lewis if Dean were a seven foot female impersonator and Jerry was a superstar stroke survivor. Our show is filled with original music, naughty comedy and a lot of conversation with the audience. What inspired you to create The Lady Winifred and Didi Show? : We had a pen that felt really good in our fingers, you know the kind? PaperMate, we think it was. It isn’t often that a writing utensil feels exactly right in one’s hands. So, we took the opportunity and ran with it. The show nearly wrote itself. What kind of theater speaks to you? What or who inspires you as an artist? : We are both inspired by different things. Didi gets excited after watching any episode of "CHiPS", while I find my motivation watching car crash compilations on YouTube. If you could work with anyone you’ve yet to work with, who would it be? : We enjoy sharing the stage with one another and never really invite anyone else to share our spotlight. But, if we had to choose someone, I think we’d both agree that to work alongside Barbara Walters would be pretty neat. What show have you recommended to your friends? : Just the one we’re in, Muffin. It would be counterproductive to do otherwise, wouldn’t you say? Who would play you in a movie about yourself and what would it be called? : The movie about us is already in pre-production at LucasFilms and it’s to be called "Grotesque and Statuesque: Episode Thirteen". Didi is played by George Wendt and I am portrayed by a cardboard cut-out of Justin Bieber. If you could go back in time and see any play or musical you missed, what would it be? : Oh, that’s easy. "Back to the Future". What’s your biggest guilty pleasure? : We both enjoy watching video clips of baby bunnies being stalked and captured by larger prey. Baby bunnies are cute, but extra stupid. If you weren’t working in theater, you would be _____? : We’d fall back on our former occupations as physical and mental therapists. What’s up next? : Didi has an appointment at the Eleventh Street Baths and I am headed to Six Flags over New Jersey to work the summer as a carnival ride.